One of the most important points to get right when river fishing for carp is to know exactly where to fish. In other words, location, location, location! You want to locate a good feature somewhere along the river. These can be very similar to those found in lakes and ponds. Places where carp can hold up in piece and quiet are good places to start, especially if there is some kind of coverage. Overhanging trees and reeds can be common along a river so you may need to find those that have further potential to them. As an example, overhanging bushes or trees that are in places where the river meets another water body may be productive features. The currents often help deposit food sources around the edges where both the flows meet together. Weed beds and lily pads can be some great features to find on rivers as well as in many lakes. The weed beds help “catch” and hold food items in place, thus, there is a reason why carp may come back to visit them on a regular basis. Fast flowing water can be great places in the summer, the water gets oxygenated at these places and as a result draw in many carp. Weirs can also be a productive feature for carp fishing on rivers as well as large groups of moored boats. These offer carp some security and warmth, as well as food sources so don’t be afraid to fish by moored up boats, especially during the colder months as boat owners may not use them as much. This makes these areas fairly quiet for carp to become settled for a few months. 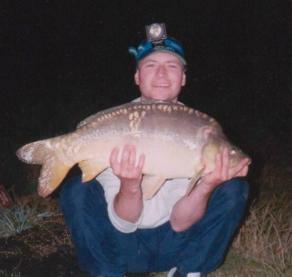 Fishing the river margins can produce good results to. River margins will often drop-off quickly to form a shelf where food items can gather together and provide fish with regular supplies of food. Placing a fishing rig at the bottom of the shelf can produce numerous carp catches. Other areas that can gather food items are in the snags. Margin snags on rivers will hold food items as they try to pass through. Snags also provide good shelter for many river carp. Learn more about fishing for carp in snags. Remember that seeing carp jump out the water may not be the best way to select where to fish. On a river the carp can move out very quickly. I feel it may be best to stick to those features that have the potential to hold carp, such as those which offer a regular food source or coverage rather than waiting to see fish jump. By all means, cast to fish that jump once you are fishing, but I wouldn’t use that sight as to where I choose to set up. As a baiting tactic, I feel it's very important to pre-bait a potential swim 2 or 3 days before fishing the river. This is a great way to hold any passing carp in your chosen area. Pre-baiting also helps to "clear" the area from the smaller fish, and you can then present a bait better for when carp move in. Keep in mind that river carp are much more active than those in lakes. This is because they need to constantly adjust themselves due to the water currents, and means they need to ingest more energy, and thus food. For this reason, a very good spot that provides them with regular food will be a potential river hotspot!